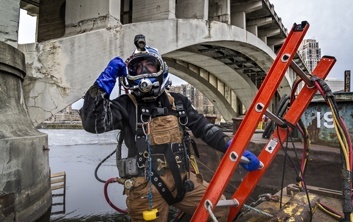 construction, or repair of existing infrastructure, our divers have the right training and equipment to complete a high quality project. Backed by one of the largest fleets of inland marine construction equipment in the United States, there is no project too large or too small that we cannot accomplish. Brennan is a proud member of the Association of Dive Contractors International (ADCI), and all of our commercial divers are certified. We can mobilize anywhere in the continental United States in a timely manner while maintaining competitive rates. J.F. Brennan Company specializes in marine construction projects throughout the inland waters of the United States. 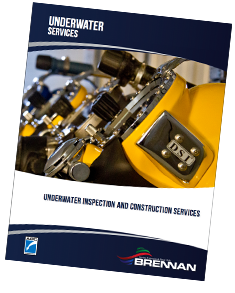 Download our dive services brochure to learn more about our underwater inspection and underwater construction services.